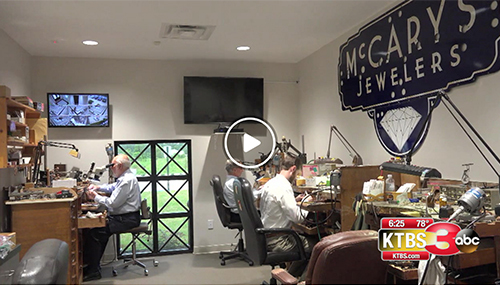 Our Story | McCary Jewelers Inc.
McCary’s Jewelers opened 75 years ago in a rented space shared with a local Barber Shop at 410 Milam Street in Downtown Shreveport. With $500 and some loaned jewelry equipment, the McCary’s family started what was primarily a watch sales and repair business, the main stock and trade of the early 1940’s. Their business journey is much like looking at snapshots of Shreveport history, as they moved, changed and grew into their established business in South Shreveport. “Back then, Youngbloods, Flournoy & Harris, and Peacocks were the principle jewelry stores and Milam Street was the hub of retail shopping. Even then we were fortunate enough to be in the right places at the right times. McCary’s established with good, loyal customers that followed us with each move,” said R.L. McCary, owner. In December of 1941 when war was declared, small businesses across the country were challenged to maintain their business sales, while the nation was rationing, and pricing was a premium for even the staple items. Jewelry was a luxury item and it wasn’t until after the war, that a real economic boost hit the local area. McCary’s became one of the main watch inspectors for the trolley drivers. With six watchmakers, high demand pocket watches and chains, and the finest suppliers, the business thrived. Soon after, a launch into fairly new services of manufacturing positioned McCary’s in what remains to be their niche in the market. Soldiers returned from war with all types of jewels and with great ease and natural ability, McCary’s was resetting stones and designing unique settings. As the Shreveport-Bossier City areas continued to grow, McCary’s capitalized on the opportunities and in 1961, was able to garner prime positioning in what was then the largest mall in the state of Louisiana, ShreveCity Shopping Center. “Shreve City opened doors for our family. Dad (R.L. McCary) left the downtown store to aid the family in operations and sales. He created a reputation for his unusual designs and has proven to be not only an artistic manufacturer, but also a respected businessman,” said Lynn McCary-Thomas, his youngest daughter. McCary’s was an anchor for 26 years in the Shreve City Shopping scene. In the mid-80’s after the local men who had originally owned and built the shopping center gradually passed away, the heirs sold to larger companies, well-known local stores began to move out to other mall establishments, while the cheaper discount stores moved in. When Penney’s decided to move in 1986 to the new Pierre Bossier Mall, R.L. McCary found a small center on East 70th Street next to the Sheraton Hotel. It was a good feeder market from Bossier City, where the business had established a strong customer base, and it was an area with great potential growth. For 20 years, McCary’s has been one of the very few jewelers in our market whose design and manufacturing is all in-house. The jewelers are an American Gem Society store, with a staff that includes a certified geologist appraiser, and caring advisors with a passion for fashion and fine jewelry. The jewelers are proud members of the American Gem Society and the Gemological Institute of America. Membership in these organizations assures McCary’s customers of the knowledge and skill of professional jewelers. McCary's provides the local area with unique, well-crafted pieces from a special collection of designers or in-house designs to create custom pieces. The business has truly touched the lives of generations of customers. “We have provided their baby gifts, their wedding rings, their anniversary surprises, their birthday celebrations, their graduations, and just very special moments. It seems there is only three degrees of separation. Our customers are so much a part of our everyday lives. We truly wouldn’t be celebrating 65 years of successful business without them, their children and their grandchildren,” said Lynn McCary-Thomas.